I love projects that don’t require a lot of prep. This is one of them. You can choose to keep this project super simple by using white paper and black oil pastel to draw the face and a colored piece of paper for the background or you can delve a little deeper. Whatever you choose, you’ll be amazed at how well this project works for all kids. I created this lesson for 2nd graders but older kids are able to really think about what makes America unique and paint their own ideas for the background. Most second graders were happy painting the American flag! 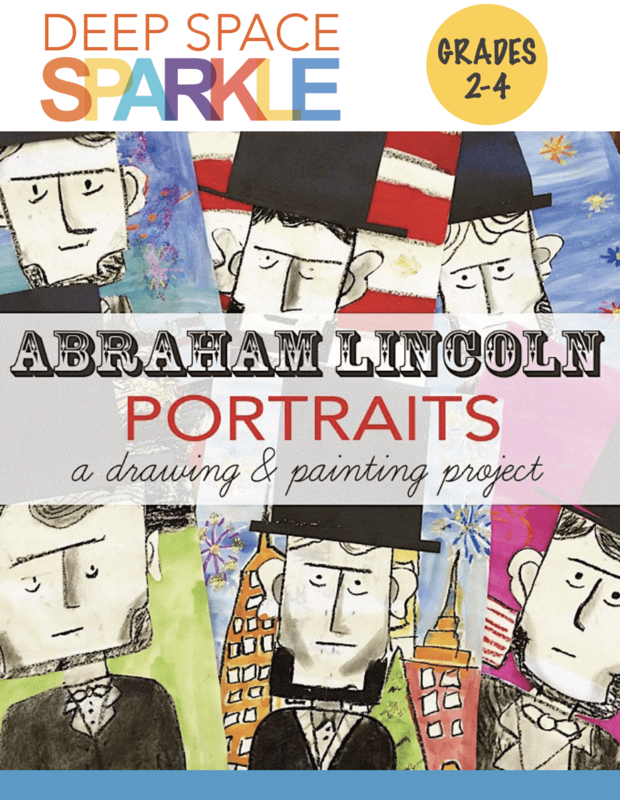 Part directed-drawing, part free-expression, this lesson offers an easy American history art activity to celebrate Lincoln’s birthday, Independence Day or President’s Day. Keep it simple by leading a directed-line drawing of Lincoln’s face then pasting onto colored paper. Or develop art skills by using oil pastel and paint to create a stunning and individual background. This lesson was created for my second and third grade students but I would recommend using it for grades 2-4. Requiring only two, 40-minute art sessions and using simple art supplies, this activity is suited for any art environment.